Car Window Tinting Calgary : Car Cosmetix Inc. Looking for car window tinting Calgary? Car window tinting is an increasingly popular and relatively simple way to customize your ride. It has the practical benefits of providing a degree of privacy for the vehicle’s occupants while at the same time shielding them from the sun’s UV rays. This in turn can bring gains in fuel efficiency as a result of the reduced need for air conditioning. And let’s face it, car window tinting not only keeps the thieves away, but it can look pretty darn cool too. But we have all seen the effects of a botched tint job where the tinting is bubbling and/or peeling at the edges. Then there are the legal aspects to consider. While car window tinting is permitted in Calgary, there are legal limits relating to the degree or darkness of the tint and to which windows it may be applied. Inadvertent illegal tinting could see you in receipt of a ticket down the road or even an expensive order to remove it. Consulting with an experienced professional from the outset can save you much time, trouble and money in the long run, while ensuring your own transportation safety. While increasingly offered as a factory option, window tinting can be applied at any time. 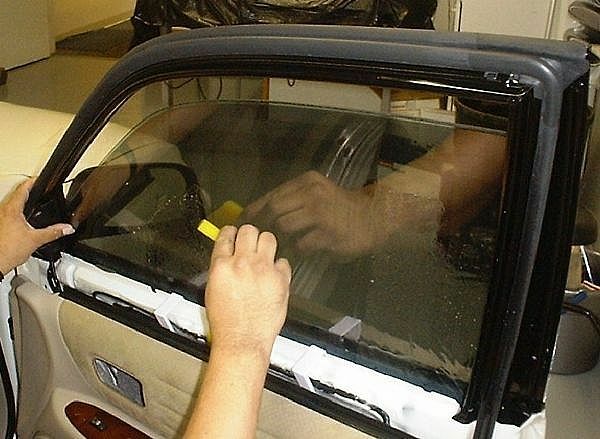 Car Cosmetix Inc. is one minor auto body repair shop in Calgary offering car window tinting as an after-market product. We have an experienced team of highly qualified auto body repair professionals who offer top tinting at competitive prices. If done right the first time, a little bit of tinting can go a long way and be enjoyed for years to come. For more info on our Calgary window tinting services check out our Window Tinting services page website or Contact Us. Car window tinting is an increasingly popular and relatively simple way to customize your ride.